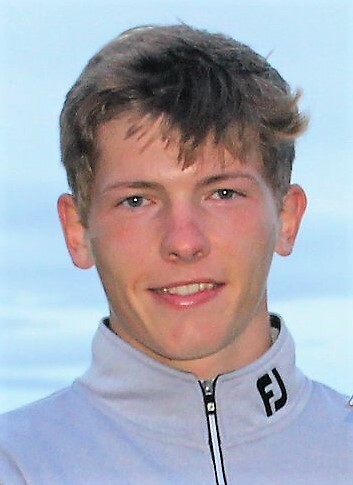 Liberton Golf Club member Kieran Cantley, who has a handicap of +3 and is a past winner of the North of Scotland open amateur championship for the David Blair Trophy, has a three-stroke lead at the halfway stage of the Scottish Champion of Champions 72 hole tournament over the Leven links, Fife. Cantley, pictured, has shot two excellent rounds of 66 for a 10-under-par tally of 132. He has spreadeagled the field with the joint second-placed Euan McIntosh (70-65) and Fraser Carr (67-68) back on 135 and the fourth placed Greg Wishart a further three shots in arrears on 138 after a pair of 69s. McIntosh's 65 was the lowest round of the opening day. Fifth placed Graeme Robertson, a former winner of the tournament, is some seven shots off the pace after 36 holes. 135 Euan McIntosh (Turnhouse) 70 65, Fraser Carr (Crail GS) 67 68. 138 Greg Wishart (Lundin) 69 69. 144 C Fyfe (Cawder) 73 71, M S Smyth 71 73. 147 J Wilson (Balmore) 75 72, B McLeod 71 76.